Welcome to Lindisfarne self catering accommodation! 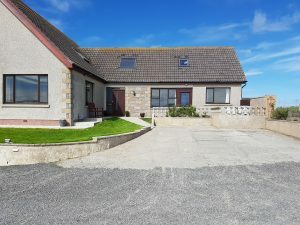 This cosy self-contained ground floor flat is set in a rural location one mile from the town of Stromness. It is on a private road with the main bus route between Stromness and Kirkwall (the two main towns in Orkney) only a 2 minute walk away. The flat has elevated views over Stromness, scapa flow, the Island of Graemsay, the Island of Hoy and the Hoy hills. Lets are from Saturday 2pm to Saturday 10am and prices are inclusive of all electricity and linen. If you would like to book for less than a week this is possible depending on availability and is priced at £60 per night.